This seven-night walking tour is the third stage of the Way of St. James Pilgrim Route and takes you through some of the most beautiful countryside with lovely towns and villages along the route. This eight-day, seven-night walking tour is the third stage of the legendary Way of St. James Pilgrim Route – one of the most famous pilgrimages in all of Christianity. 4 to 7 hours walking a day, easy route with 50 to 350 m of altitude change per day. Day 1: Arrival at Conques (overnight and dinner). Day 2: Conques – Decazeville, 20 km/12.5 miles. Altitude at departure: 280m/924ft. After the bridge over the Dourdou, the route climbs up the charming Chapel of St. Foy, with one last look at beautiful Conques. Soon after, you have a choice of shorter or longer routes to bring you to the old mining town of Decazaville. Altitude at arrival: 225m/743ft. 4 hours 30. Conques to Livinhac le Haut 23.5km and then the next day is 25.4km from Livinhac le Haut to Figeac if you wish to avoid the 29km day. Day 3: Decazeville – Figeac, 29 km/18.1 miles. A short climb to the Saint Roch chapel (353m/1165ft) and then down to the Lot Valley and on to Livinhac (220m/726ft), followed by a fairly strenuous climb into the Lot department and the aptly named village of Montredon (‘the roundmountain’). 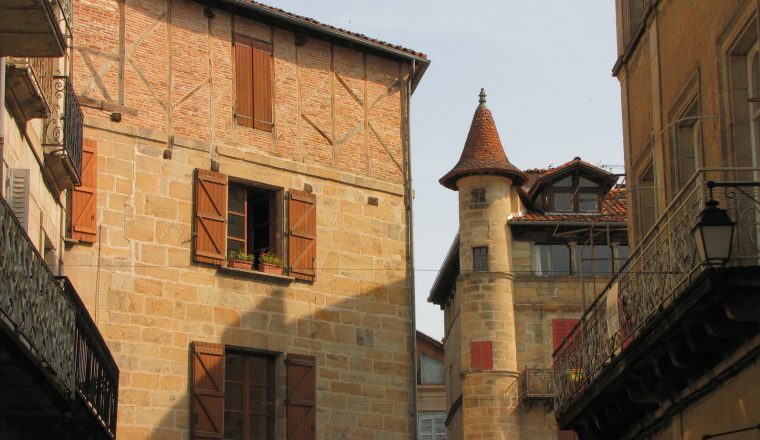 The route takes you then to Figeac with its historic centre. Altitude at arrival: 194m/640ft. 9 hours. Day 4: Figeac – Cajarc, 30 km/18.7 miles. We reach Carjac by walking on the plateau that separates the Cele and Lot valleys. After Faycelles (319m/1053ft) and Beduer, the landscape changes. 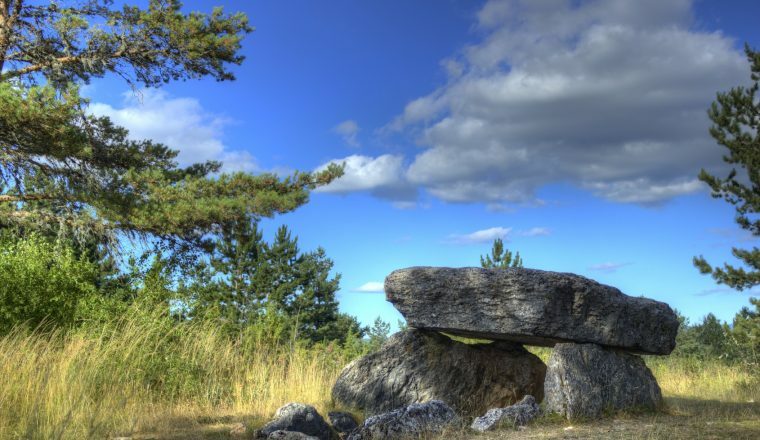 Menhirs and dolmens appear, along with charming dry-stone constructions which accompany us to Grealou (374m/1234ft) in the extreme south of the regional park of the Causses du Quercy; and then again into the valley of the Lot. Altitude at arrival: 160m/528ft. 31.5 kms/19.7 miles. 8 hours 30. Day 5: Cajarc – Limogne, 18 km/11.25 miles. Head southwards to cross a marshy plain in a meander of the River Lot to the lush pastures of Gaillac. Then it is up to the Causse de Limogne where stone is used for everything. Before reaching Limogne (famous for its truffle market), we pass by Mas de Pech (339m/1119ft) and the Mas de Borie. Altitude at arrival: 300m/990ft. 4 hours 15. Day 6: Limogne – Lalbenque, 24 km/15 miles. Continue across the Causse, skirting the village of Varaire and become one with the old Roman road (ancient paving stones still lie beneath the soil). At the D55, we leave the path to reach Lalbenque. Altitude at arrival: 250m/825ft. 5 hours. 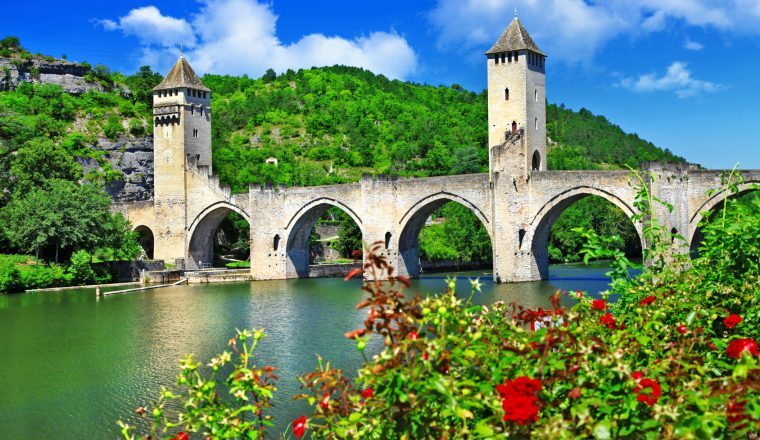 Day 7: Lalbenque – Cahors, 21 km/13.1 miles. There are a couple of options. Purists will return to the where they joined the D55, others will continue onwards via another path to join the main route further on. Then one more wild plateau before the descent into handsome Cahors. Altitude at arrival: 122m/403ft. 4 hours 30.